Former President George W. Bush reaffirmed his support for Supreme Court nominee Brett Kavanaugh in a letter to Politico Tuesday. Bush’s statement comes as Kavanaugh faces an allegation he made unwanted sexual advances as a 17-year-old in the early 1980s. Christine Blasey Ford claimed in a letter to Sen. Dianne Feinstein (D., Calif.) that Kavanaugh "physically pushed" and "tried to disrobe" her while they were high school students. Kavanaugh rejected the allegations. "I categorically and unequivocally deny this allegation," he said. "I did not do this back in high school or at any time." He reiterated his rejection in a second statement on Monday and said that, in the wake of Ford's allegation, he was willing to talk to the Senate Judiciary Committee again. 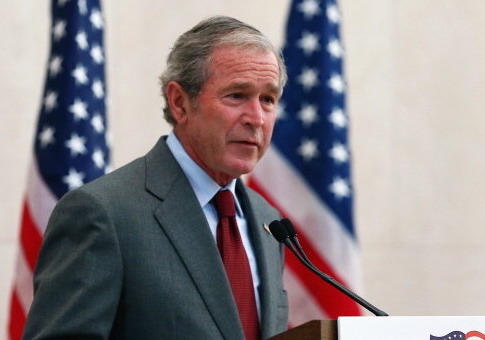 "[W]e stand by our comments the night Judge Kavanaugh was nominated," Bush wrote. The nominee served as staff secretary in the Bush White House. Bush’s support for Kavanaugh’s conduct and character follows statements of the same from two of Kavanaugh’s ex-girlfriends. Bush previously wrote of Kavanaugh's accomplishments in and out of the court room. "Brett is a brilliant jurist who has faithfully applied the Constitution and laws throughout his 12 years on the D.C. Circuit. He is a fine husband, father, and friend — and a man of the highest integrity," he wrote. The accusations have led to the rescheduling of Kavanaugh’s confirmation vote, which had been slated for Thursday. Sen. Susan Collins (R., Maine) wants each to testify under oath before the committee, and to answer questions from opposing counsel. Despite claims yesterday by her lawyer that Ford would testify publicly, Ford has yet to agree to testify before the Senate Judiciary Committee. Grassley told reporters staff had reached out repeatedly to Ford, but had not yet received any reply. Senate Majority Leader Mitch McConnell (R., Ky.) has offered Ford the chance to testify in a closed hearing. Democrats have called for any vote to be delayed, pending an FBI investigation, testimony, further scrutiny, and debate. The New York Times editorial board called on Monday for the confirmation to be delayed "however long it takes," pending further investigation. Feinstein sat on the letter from Ford for weeks before leaking the allegation days before the Senate was to vote on Kavanaugh’s confirmation. She has been fiercely criticized within California for the delay. In response to the delay, Sen. Orrin Hatch (R., Utah) Tweeted Tuesday afternoon that "[s]omething isn't adding up." Republicans, led by @ChuckGrassley, have moved committee business back in order to investigate these claims made by Dr. Ford. Meanwhile Senate Democrats refuse even join in background calls to begin an investigation. Bush’s statements in support of Kavanaugh offer a rare moment of public agreement with President Donald Trump. "It should have been brought up long ago," Trump said today. "That's what you have hearings for. You don't wait until the hearing is over and then all of a sudden bring it up," he told reporters. "Why didn't the Democrats bring it up then? Because they obstruct and resist. That's the name of their campaign against me. They just resist and they just obstruct." This entry was posted in Politics and tagged Brett Kavanaugh, George W. Bush. Bookmark the permalink.